BT is creating 202 new apprenticeship and graduate jobs in London as part of a new UK-wide drive to recruit the best tech talent available. The company aims to employ more than 1,300 people across the country in a number of different roles, from TV production, engineering, customer service and cyber-security to help tackle the growing threat of cyber-crime. Plymouth and Exeter are amongst the locations to benefit from latest jobs drive by BT Group. The development has been welcomed by the Prime Minister, Theresa May. Birmingham, Coventry, Hereford, Stoke-on-Trent, West Bromwich and Yarnfield are among the areas to benefit from the latest jobs drive by BT Group. The development has been welcomed by the Prime Minister, Theresa May. BT is creating 76 new apprenticeship and graduate jobs across Scotland as part of a new UK-wide drive to recruit the best tech talent available. Glasgow, Dundee, Edinburgh and Greenock are among the areas to benefit. BT is looking for young talent to join a growing area of its business which is changing the way engineers work. 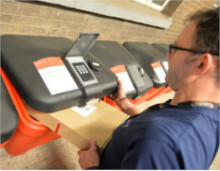 They will be working for Pelipod, a company based at Birmingham Business Park, near Solihull, which produces and monitors thousands of ‘intelligent’ locked parcel boxes across the UK, and will form a key part of Pelipod's exciting expansion plans.